Mattel might be best known for its line of fashionable Barbies equipped with dream homes, high heels, and pink convertibles, but the manufacturer's latest line of dolls comes with a more adventurous set of accessories: capes, swords, and lassos, to name a few. 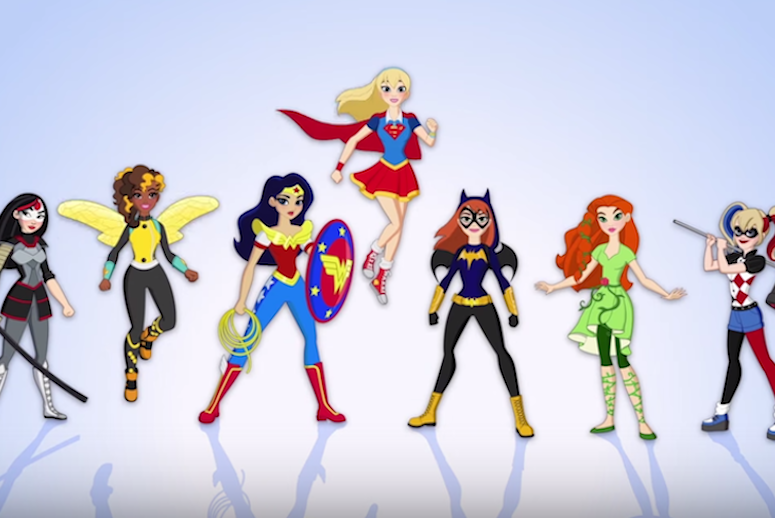 A collaboration between the toy company and publisher DC Comics, DC Super Hero Girls is a new series of seven action figures designed to introduce heroines like Wonder Woman and Supergirl to a new audience: 6 to 12 year-old girls. In a statement earlier this month, president of DC Entertainment Diane Nelson positioned the dolls as part of the company's long-term strategy for offering "a diverse array of strong female characters" in a variety of platforms including television, books, and movies. The superhero dolls, which were unveiled at New York Comic Con last weekend, will roll out next year along with an accompanying web series and graphic novel. They're being marketed as Mattel's first-ever action figures designed for girls. The toys aren't just an obvious departure from Barbie, the iconic plastic doll that's suffered slumping sales amid criticism of her unrealistic body proportions, among other features. The Super Hero Girls come as DC prepares to debut its Supergirl TV show later this month and the long-awaited Wonder Woman movie in 2017, at at time when many fans have been vocal about demanding more representations of female superheroes in everything from movies to merchandise. When Marvel's Avengers: Age of Ultron hit theaters last May, for example, fans caused a social media firestorm when they noticed that the movie's only female superhero, Black Widow, was absent from much of the Disney merchandising. Even actor Mark Ruffalo, who played the Hulk in the movie, joined in on the chorus when he tweeted, "We need more #BlackWidow merchandise for my daughters and nieces." It's not an entirely new complaint. When movie-goers observed a lack of merchandise depicting the heroine Gamora in Guardians of the Galaxy last summer, they took to Twitter with the hashtag #wheresgamora to call attention to the issue. While many advocates see the Super Hero Girls as evidence that comic book publishers and merchandisers alike are starting to invest in female audiences—and especially young girls—the new line has not been without criticism. "Rather than creating a separate superhero club for girls, why not stop shutting them out of the superhero club in the first place?" Jess Day, a spokesperson for the campaign Let Toys be Toys, which advocates against gender stereotyping, told The Guardian. She added, "What we'd like to see are toy ranges that include female characters alongside males, and marketing that's inclusive to both boys and girls."